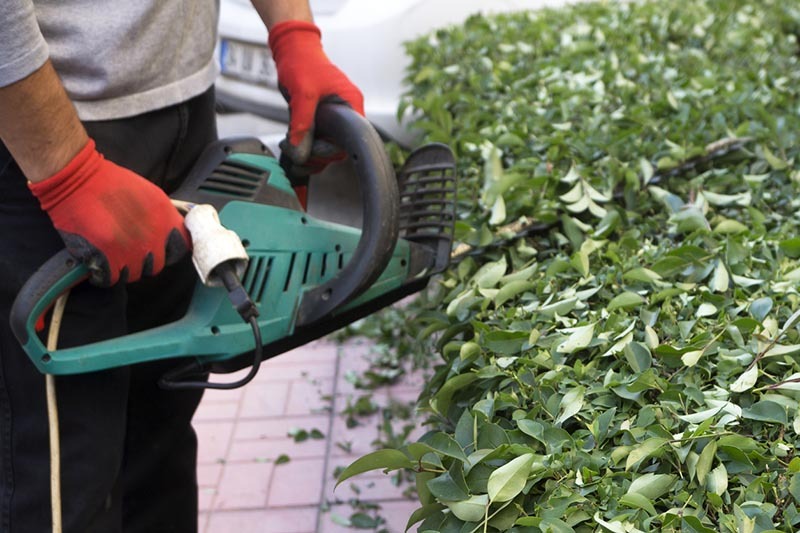 Johnson’s Landscaping Service, Inc. offers more than gorgeous lawns and gardens. We have a design and carpentry team second to none that can transform your back yard into a peaceful and picturesque space for you and your family to enjoy by building fences, decks, and gazebos. Need a comfortable place for entertaining? Is your garden ready for an eye-catching enhancement with a gazebo or other wooden outdoor piece? 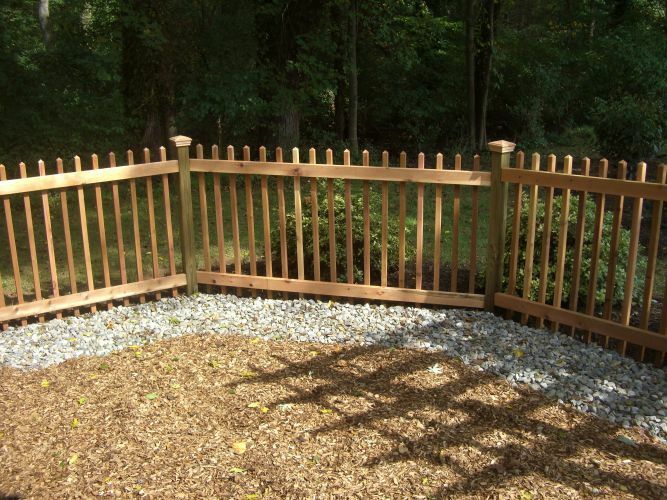 Do you need an aesthetically pleasing fence that also offers your family privacy? 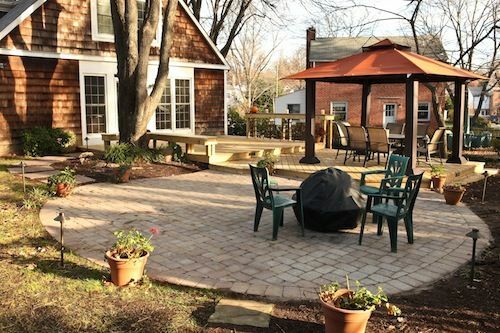 Many clients of Johnson’s Landscaping Service, Inc. now enjoy better outdoor living because of the quality decks, gazebos, and fences custom built by our carpentry team as well as other features like arbors, trellises, and pergolas. Any one, or any combination, of these features may be just what your back yard needs to reach its full potential. Johnson’s Landscaping relies on repeat business. If we didn’t wow our clients, we couldn’t keep going for generations. Johnson’s Landscape does an excellent job maintaining my yard and planting quality plants when asked. I am generally very happy with their services. Charles F.
We love Johnson’s Landscapers! Our lawn and gardens have never looked as nice as they do now that Johnson’s have been taking care of everything. We like the one-stop approach. Instead of planting flowers in our gardens and pots ourselves, we now come home after work and it’s all done. Kevin B. Great service is in our DNA. We focus intently on meeting your needs. That’s why our 5 Step Process ensures open communication throughout. Our carpenters want your backyard to reflect your vision. That’s why all our carpentry work involves our collaborative 5-step process. We get to know each other in an initial phone call. This lets us understand what you’re looking for and how much you have budgeted to get it done. We also use this time for you to learn more about us. A design team member visits your site and start to get a lay of the land. With a better idea of what’s possible, we can refine our shared vision. 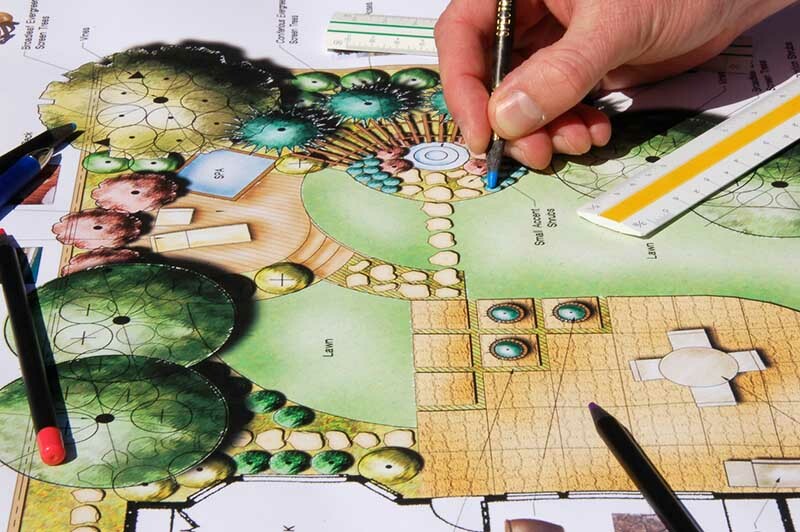 Your designer builds a scope of work that includes estimates on labor and materials. This draft gives you a chance to give feedback on any part of the project. It’s the beginning of the contract process. The prep work and collaborative nature of our methods pay off in the installations, which are usually efficient and precise. Your project should come together just as you envisioned it. You want to keep your new fence, deck or gazebo looking its best for years to come, so you can get the most out of it and retain its value. Talk to your contact about our maintenance options. There may be nothing that can enhance your property as much as a good fence. 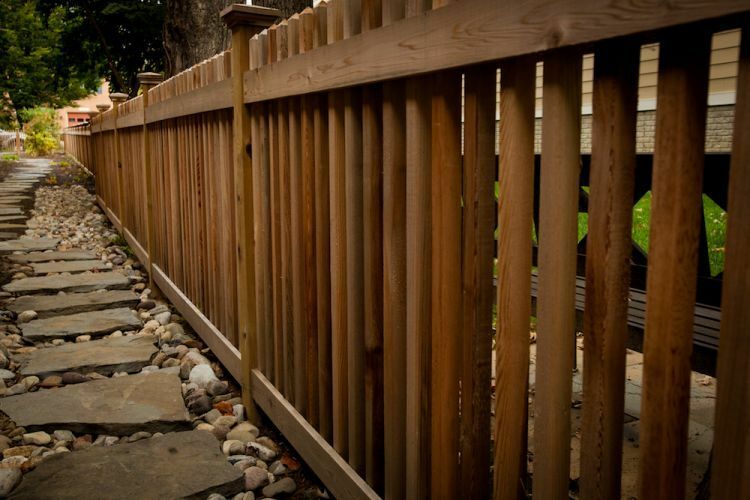 Fencing may not sound as flashy as a beautiful deck or garden, but that doesn’t have to be the case. Our design team can assist you in finding the right material, height, and aesthetics for your property and budget. Not only does fencing automatically increase your property value, but also it is a versatile tool that can help you create the home you’ve been wanting. If you aim to make your front yard look more sophisticated, a low fence can be the frame that sets off your landscaping beautifully. 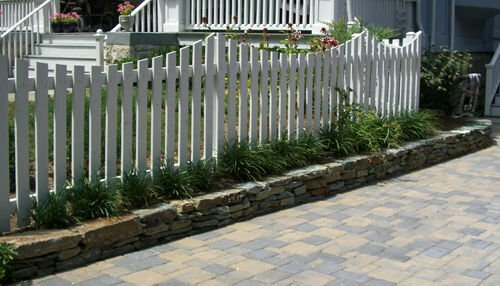 The right fence can transform your front walkway from purely functional to picturesque when paired with gorgeous landscaping or walkways. And of course, you can’t forget functionality when it comes to quality fencing. Fences help protect your home, family, and property. If you have children or pets, a fence can ensure that they will always be kept safely in sight so you can relax. The team at Johnson’s Landscaping Services can even build a standalone area on your property for your furry friends to roam freely and our design team will take height into consideration if your pup is a leaper. Contact us to learn about the different materials, styles, and features like gates and post caps we have to offer. In addition to the fencing our clients and their guests enjoy the many and varied arbors we custom build for entrances to front yards, backyards, and gardens. Define your property and frame everything within it beautifully with a new fence designed and built by our experienced hands. Nothing maximizes the useable space in your backyard like a deck. Adding a quality deck to your home gives you the ability to entertain more than any other outdoor piece. Whether you want a space on your property to grill, dine, or play, a deck is the foundation of any outdoor living space. Perhaps you have a bigger project in mind. If you want to watch the game outside or have an entire outdoor kitchen and living space, it can all start with a well-built deck. Our design team can help you get the most out of your backyard with your budget and available space always kept in mind. Crafted to meet your design specifications, our decks offer our clients increased living and entertainment space. Johnson’s Landscaping Services would never overlook functional features such as drainage paths when designing or installing your deck. And while sitting on your deck overlooking the landscape, you can remain cool underneath a custom-built pergola, designed to bring shade and, if desired, charming flowering vines throughout. That’s the advantage of having a deck in your backyard: It is completely customizable to match your vision of the perfect outdoor living space. 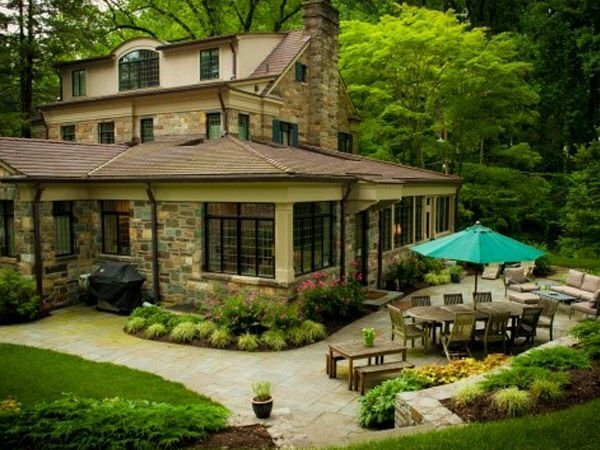 If you’ve been using Johnson’s Landscaping Services to create a gorgeous yard and garden, then you’ll want to have an equally pleasing space to enjoy it from. In terms of pure beauty and uniqueness in your landscape, nothing compares to a gazebo. The JLS team is always excited to have the opportunity to design and build a gazebo for our clients. Each gazebo, through its design and decisions such as placement, is an original piece of carpentry that also gives your property a feeling of timeless beauty. Let our landscape architects design, and our carpenters install, a gazebo for you and your guests to further enjoy your garden and patio. We can add benches or even swinging chair to your new gazebo. A gazebo is not only a pleasing feature but also a peaceful spot for you to relax with a book, share a glass of wine with guests, or just take in the beauty of your home. 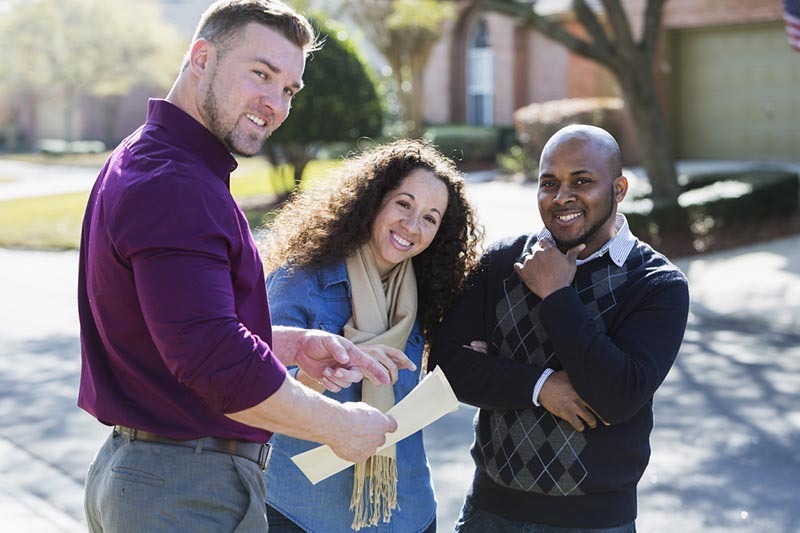 If you’ve been looking for a way to make your property stand out. Our design team knows that any feature you are looking for isn’t a standalone piece. A deck, gazebo, or even your fencing is part of a whole. That’s why Johnson’s ability to do it all is so unique. Not only can we give you ideas as to what might look best next to your new gazebo, we can build it too. On your deck or elsewhere in your landscape, Johnson’s Landscaping carpentry crew can build a trellis to train flowering plants up any wall or lattice structure. A well-built trellis with its accompanying vines can complement any quality deck or pergola. 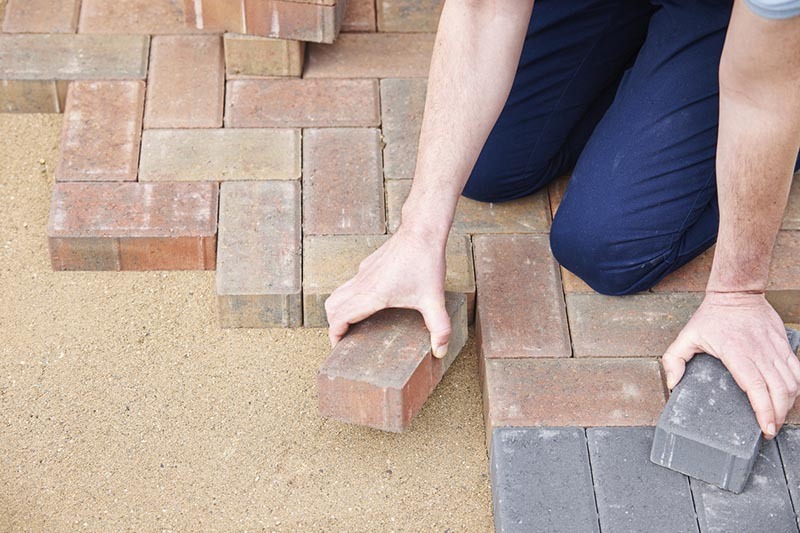 If you want one-stop shopping for all your landscaping and outdoor carpentry needs, Johnson’s Landscaping Service’s designers and carpentry division can meet your outdoor living needs and dreams. 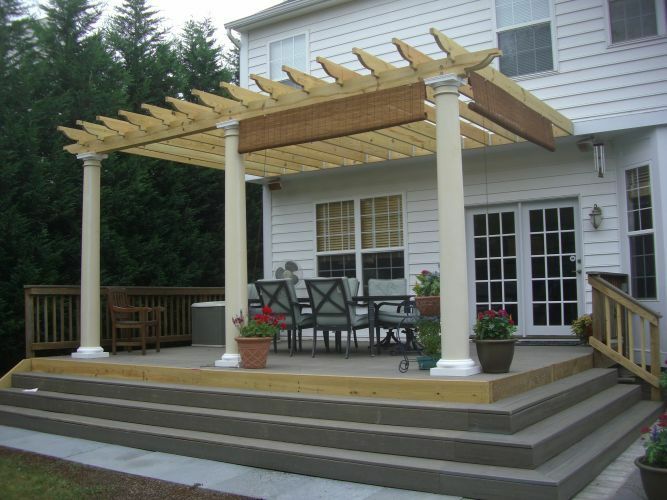 For custom built decks, fences, and gazebos contact Johnson’s Landscaping Service today! We can give you a free estimate and help you start today.